Berchtesgaden is a famous Bavarian mountain resort town in southeast Germany. If you look at a map of Germany, the Berchtesgaden area is the little protrusion at the bottom that’s almost totally surrounded by Austria. 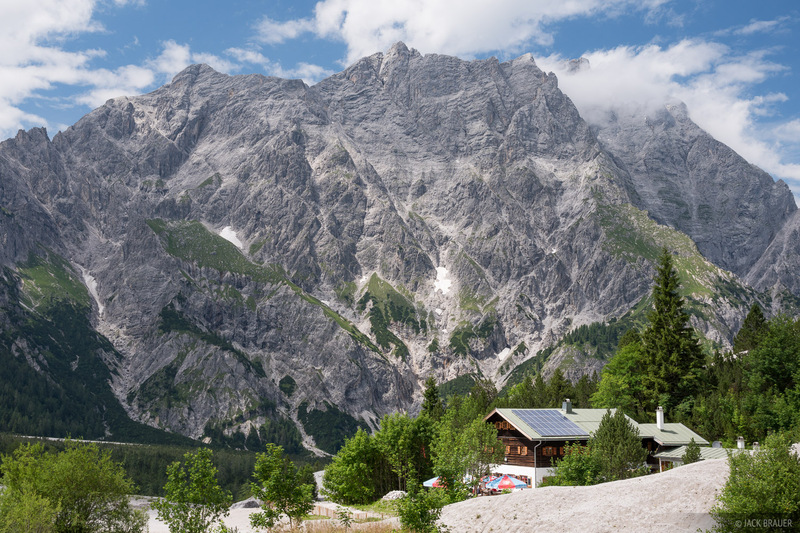 The area is famous for the gorgeous fjord-like Königssee lake and the massive peak of Watzmann which towers over it. 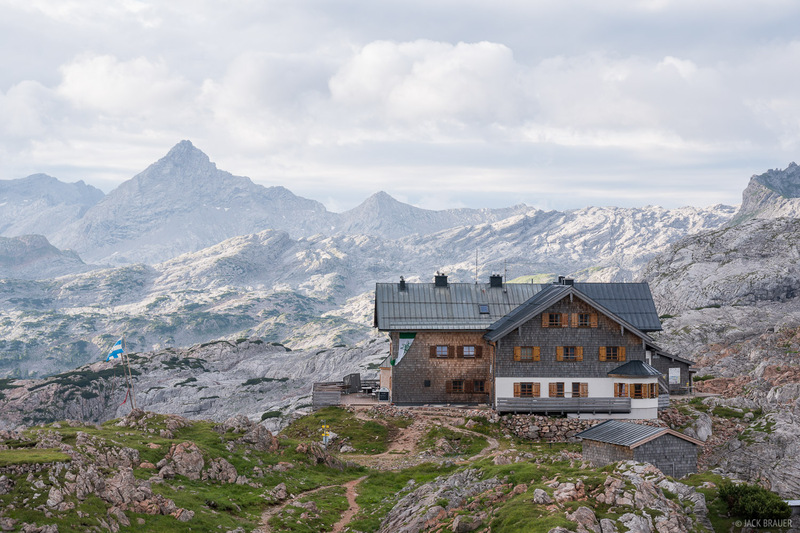 In July we spent three days relaxing around town waiting for the rainy weather to pass — which fortunately it [kind of] did — then we headed out on a three night hut trek around Watzmann via the Wimbachgrieshütte, Ingolstädterhütte, and Kärlingerhaus. 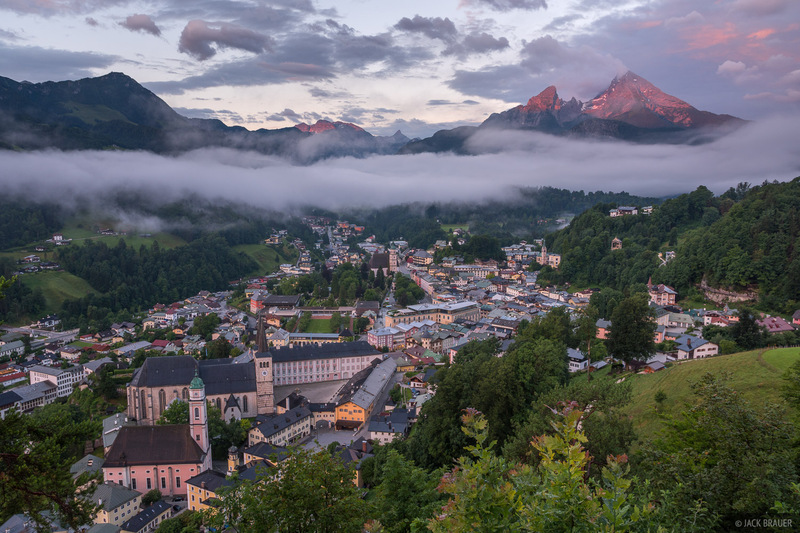 As rainy weather clears off, sunrise light illuminates Watzmann over the town of Berchtesgaden. 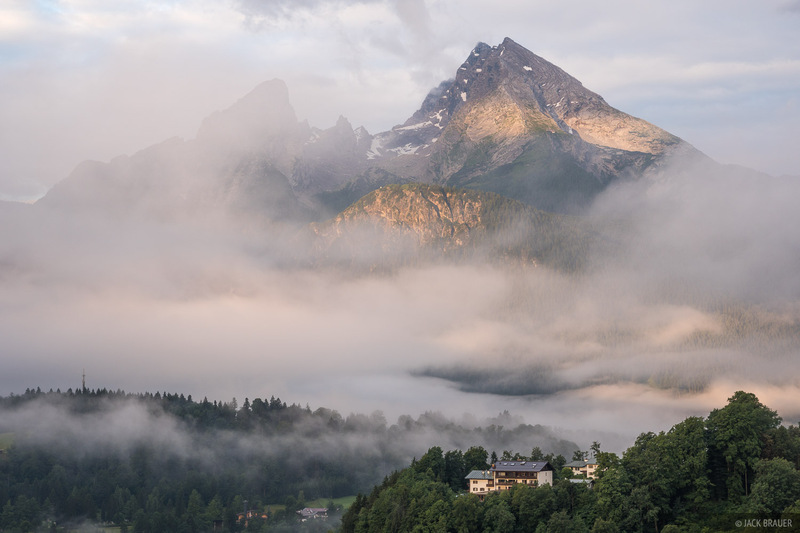 During our rainy (and relaxing) three day stay in Berchtesgaden, I walked to this overlook just about every morning and evening in hopes of decent light. I was pretty thrilled the last morning when the clouds cleared at sunrise! 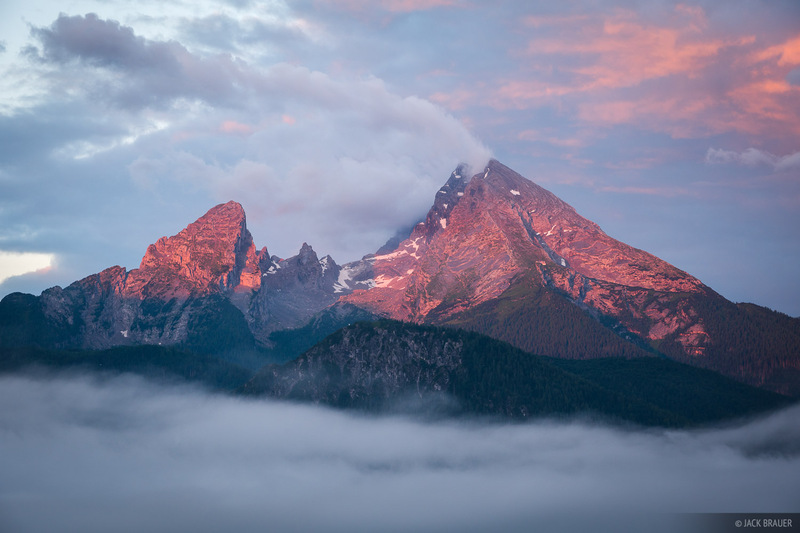 Sunrise light on Watzmann (2713 m / 8900 ft). 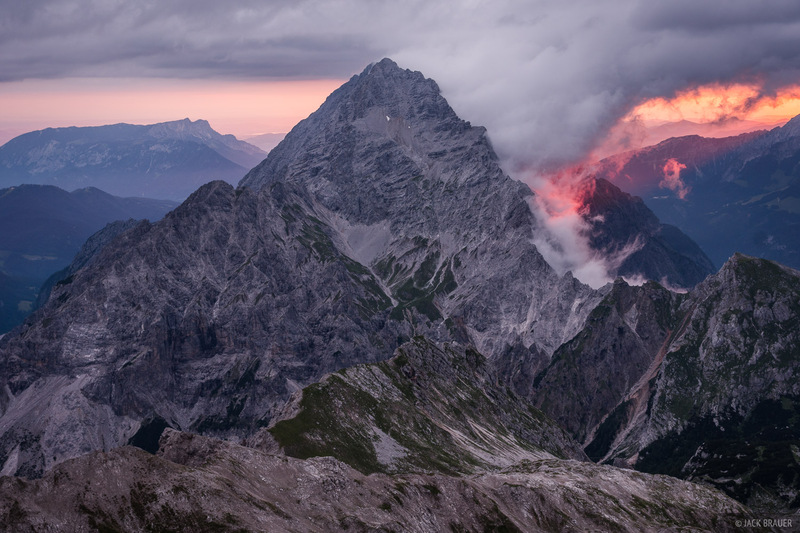 Low clouds swirl below Watzmann. 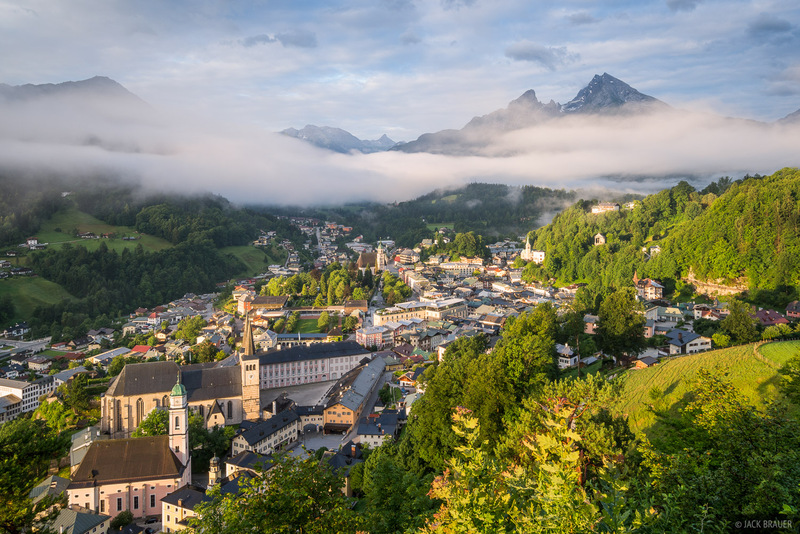 Berchtesgaden in the morning light. Wimbachklamm with its many waterfalls. 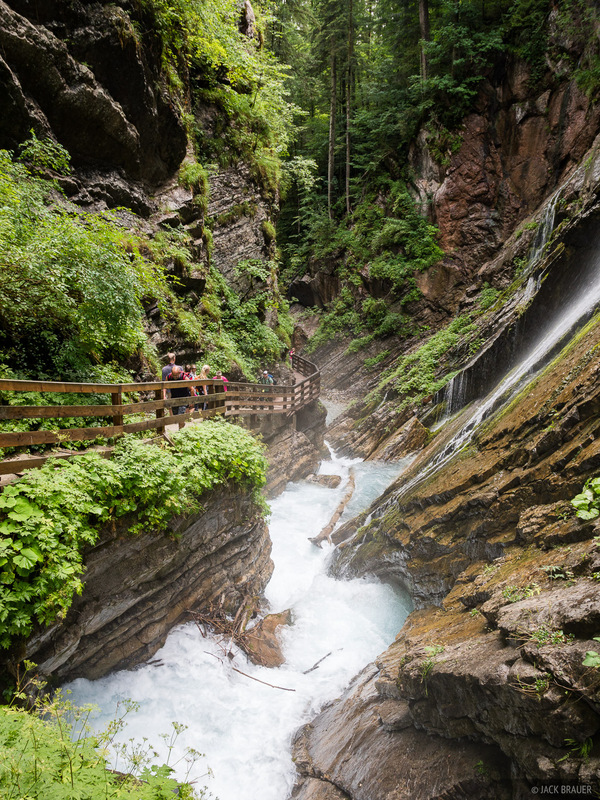 Our trail to the Wimbachgrieshütte took us through the scenic Wimbachklamm with its many waterfalls. The hike to the Wimbachgrieshütte was uneventful and quicker than I expected, so we just relaxed around the hut the rest of the afternoon until the rain returned and forced us inside. 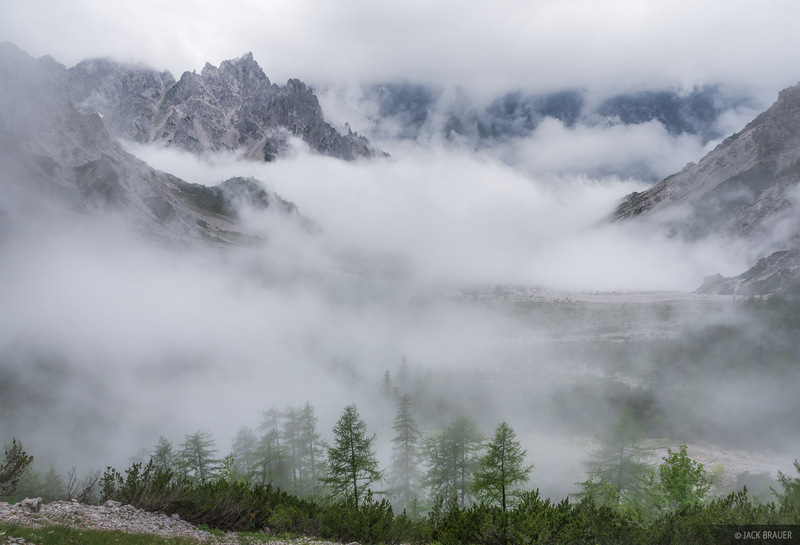 Misty weather above the valley where the Wimbachgrieshütte is located. Hachelkopf emerging from the clouds, as seen from the summit of Hirshwiese. From the Wimbachgrieshütte we hiked up to the summit of Hirshwiese in hopes of a prime view of the massive east face of Watzmann, but unfortunately most of the mountain remained covered in a blanket of clouds for the three hours we waited up there before descending and continuing towards the Ingolstädterhütte. 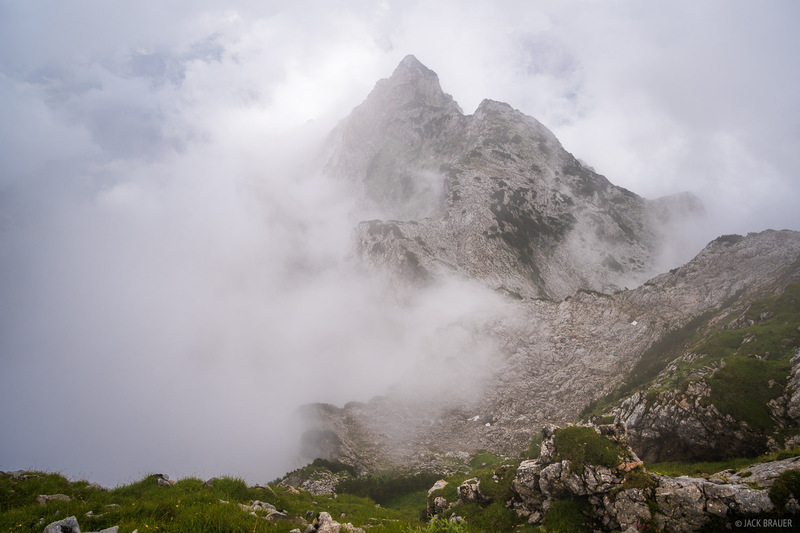 I was happy, however, to shoot this photo of Hachelkopf emerging from the clouds. 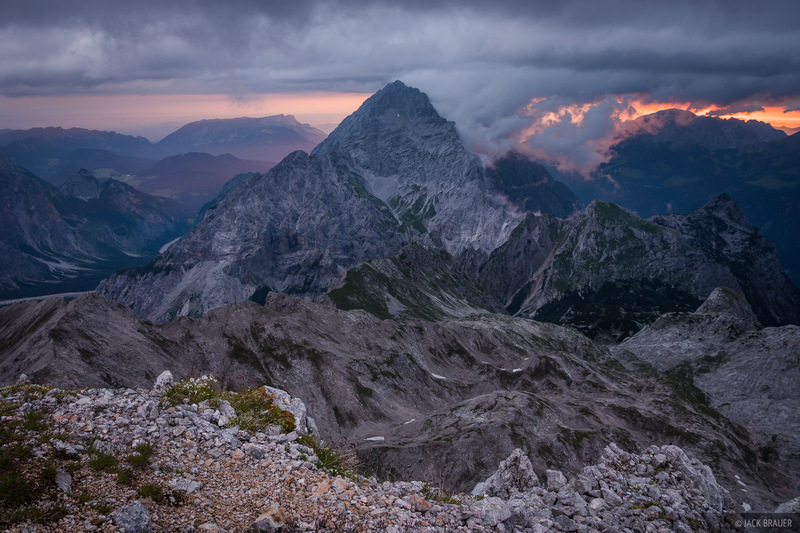 Atop the Berchtesgaden Alps is a broad limestone plateau called the Steinerne Meer, or Stony Sea. 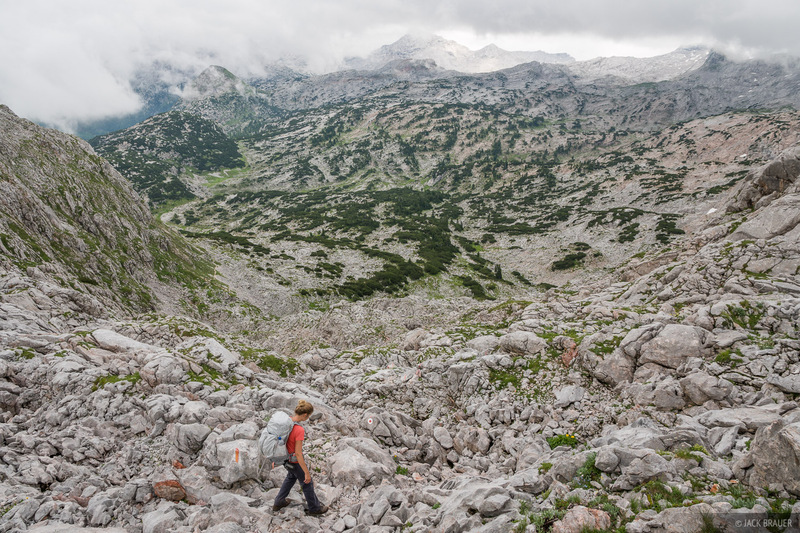 Hiking across this terrain can be quite tedious and frustrating as the eroded limestone creates sharp rock, crevasses, and all sorts of rugged obstacles to carefully negociate. 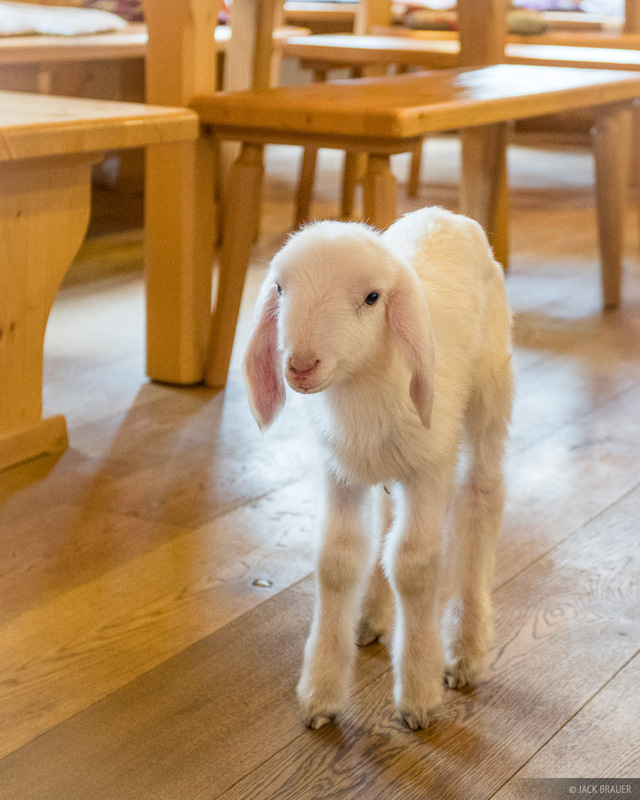 A new resident of the Ingolstädterhütte was Sep, a newborn lamb who recently became the hut pet. Apparently somebody found this lamb in a small meadow somewhere below the hut and its mother had died during birth. Not knowing what else to do, they brought the lamb up to the hut where it roamed around getting petted by all the kids and following around the hut workers who fed him and were taking care of him. I'm not sure what will happen to Sep; perhaps someday soon the farmer will come up and get him. 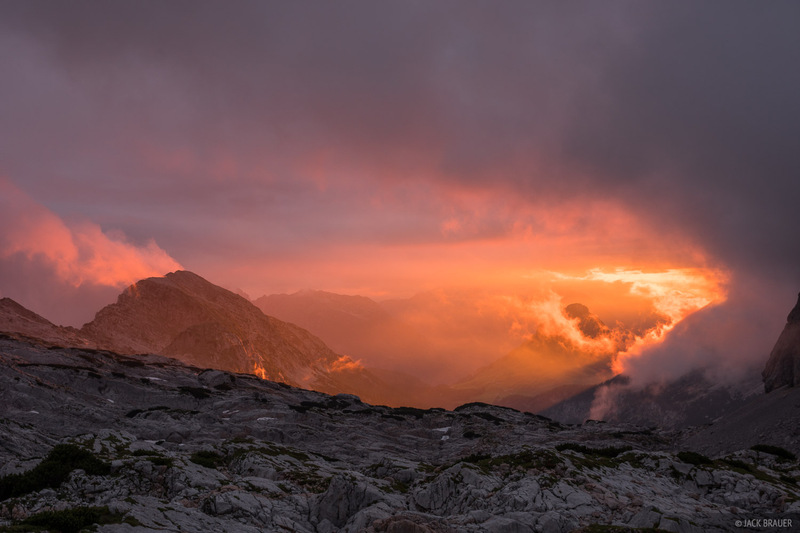 Spectacular sunset light beams through a gap in the clouds, as seen from near the Ingolstädterhütte. I woke up at 3:15 in the morning at the Ingolstädterhütte and hiked up to the summit of nearby Grosse Hundstod (2590 m) where I hoped to catch a view of Watzmann. Since the peak had been covered in clouds for most of the entire previous 5 days, I knew my chances of seeing it unveiled for sunrise were pretty slim, but I was there and I knew I had better try. So I was elated when I finally reached the summit and saw Watzmann in all its glory! 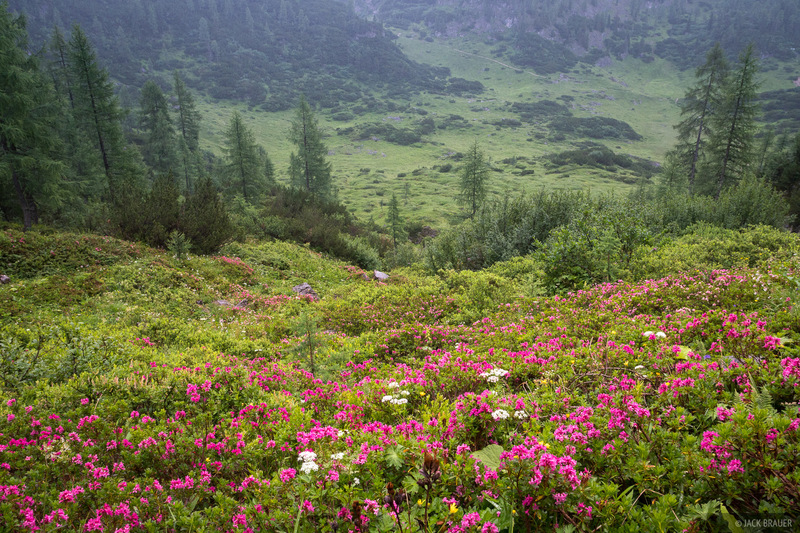 Alpenrose wildflowers in the rain above the Kärlingerhaus. The Kärlingerhaus and Funtensee lake. On the way from the Ingolstädterhütte to our planned destination of the Wasseralm hut, the rain came back in force. 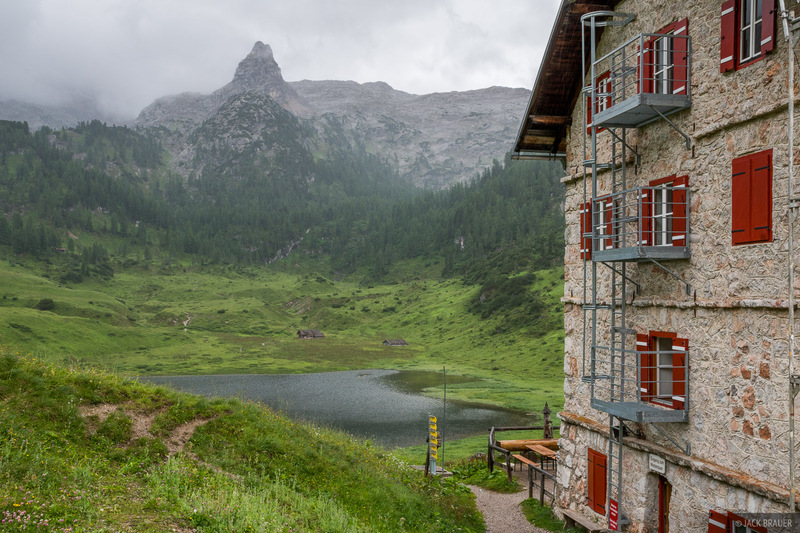 We stopped for lunch in the Kärlingerhaus and were quickly seduced by its charming location next to the Funtensee lake in a verdant green valley. With nothing but more rain in the forecast, it was pretty easy to make the decision to just stay here for the night then hike out the next day. 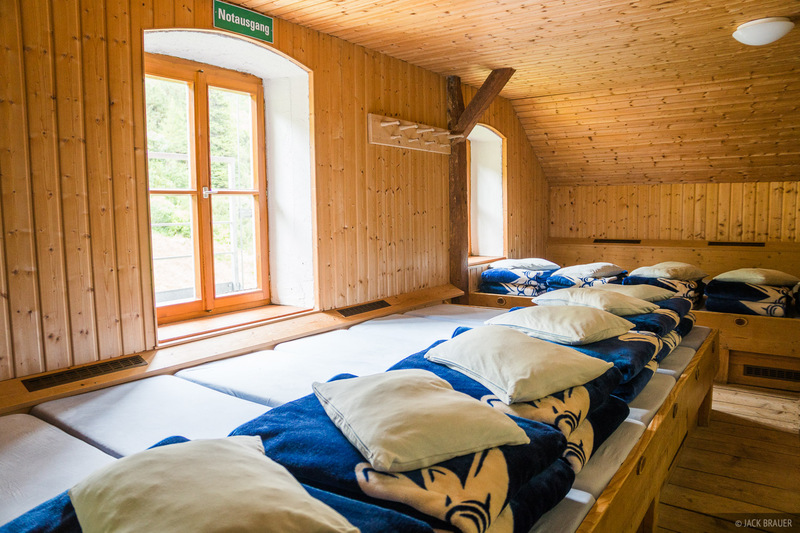 A typical dorm room in an Alpine hut. It poured all night at the Kärlingerhaus and didn't let up in the morning. 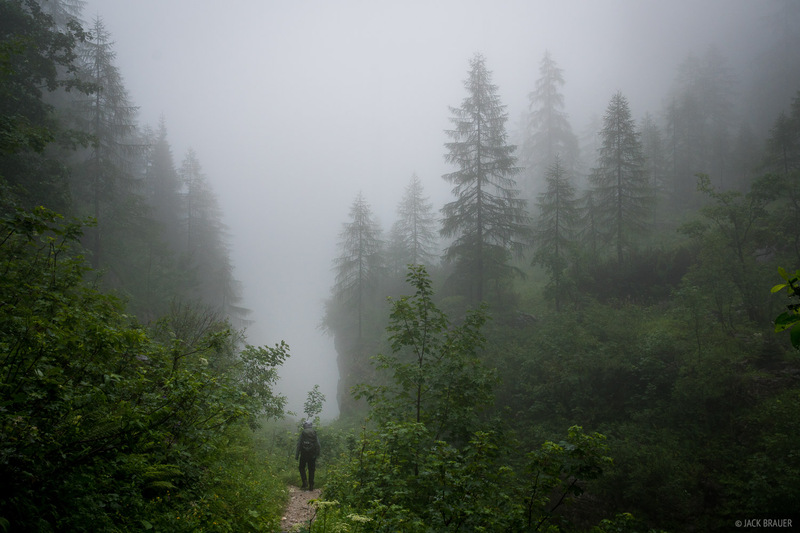 We had no choice but to hike out in the rain down to Königssee. 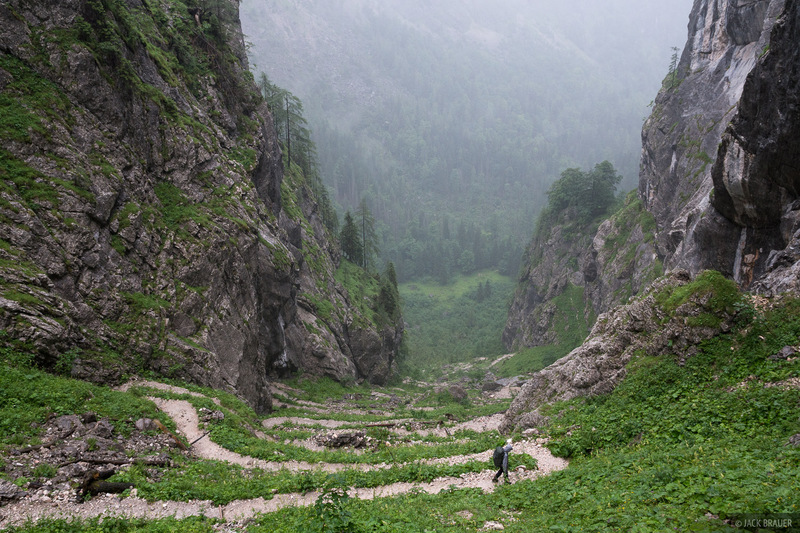 On the way down from Kärlingerhaus to Königsee, we passed through the narrow cleft of Saugasse with its many switchbacks. The ferry on Königssee from Sankt Bartholomä back to Berchtesgaden. 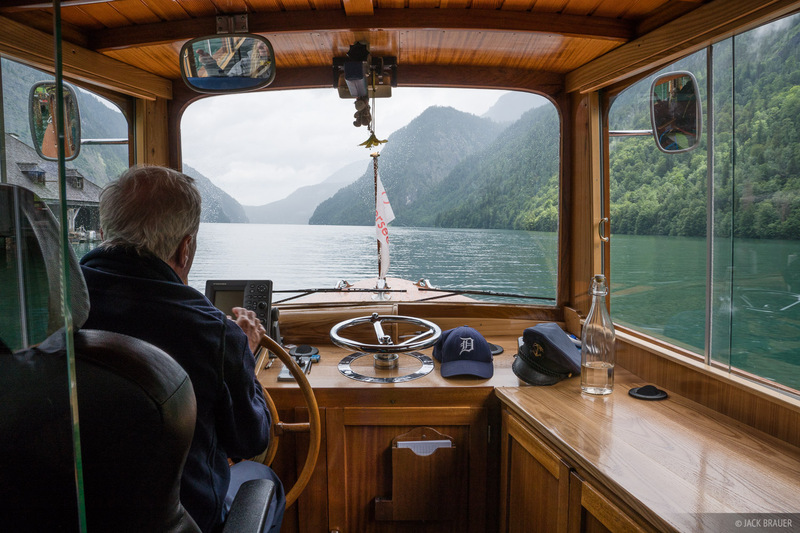 After hiking out in the rain down to Königssee, we caught the ferry from Sankt Bartholomä back to Berchtesgaden, then on to the train station for a three hour ride to the town of Schladming where we’d start our next trek in the Dachstein the next day. 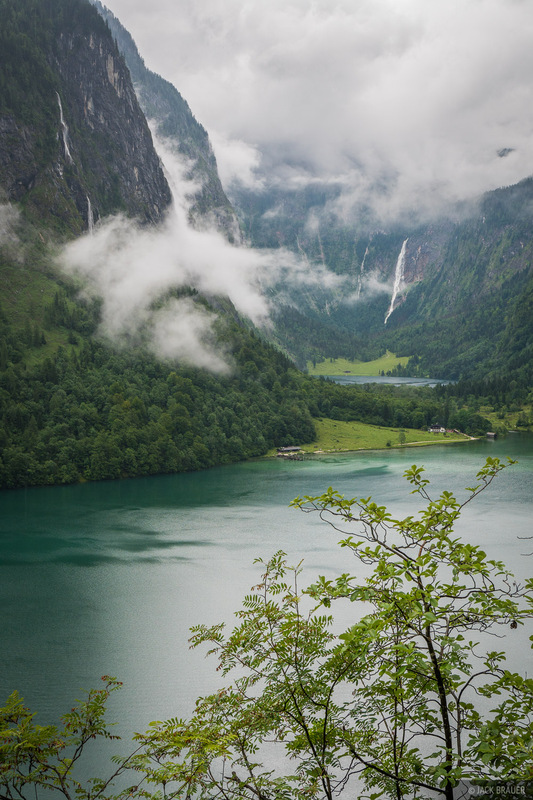 With the rainy weather and time running out on our Alps trip, our trek in Berchtesgaden was shorter than it could have been, and I never had the opportunity to photograph the beautiful Königsee as I might have hoped to. But nonetheless it was another fantastic trek in the Alps, and it left me eager to return someday to experience more of this beautiful area! Posted in Backpacking & Trekking, Alps & Europe and tagged Germany.